Clover is a high-quality feed. There are a number of clover species available with white clover and red clover the most commonly used. White clover is perennial forage legume important in New Zealand dairy pastures. It is grown throughout New Zealand and performs well on moderate to highly fertile soils, but being summer active can be less productive and persistent in dry situations. Fixes N in pastures, improving total pasture production and helping develop organic matter in poorer soils. 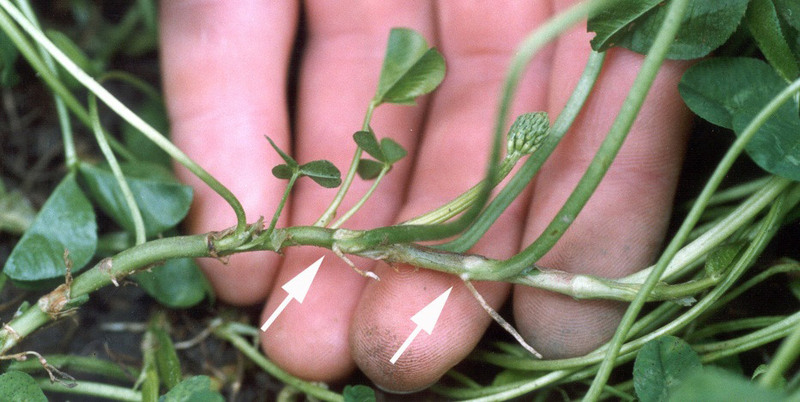 A clover stolon has a number of growing points along it as indicated (by white arrows). A high number of stolon growing points improves persistence, as each has roots and is a potentially a new plant. Good grazing management (grazing at the right time and maintaining consistent grazing residual) allows light into the base of the pastures to prevent shading and promote white clover growth. This is particularly important in mid-late spring, as white clover has little winter growth and is slower to start growing in spring. White clover cultivars are classed on leaf size, with large-leaved cultivars generally more productive, but medium-leaved having a higher growing point density making them more persistent. Large-leaved: cultivars grow taller and more upright, have thick stolons and robust roots. They tend to be higher yielding, but have fewer stolon growing points and less capacity to regenerate and persist. For this reason they typically sown mixed 50:50 with medium-leaved cultivars. Medium-leaved: cultivars are intermediate in features. The original Grasslands Huia was widely sown, but has now been superseded by a range of modern cultivars with higher yield potential and better robustness through much greater stolon densities. Medium-leaved types perform well under a range of grazing managements, and are typically mixed 50:50 with large-leaved types when sowing dairy pastures. Small-leaved: cultivars are generally not used for dairying. They are low growing, lower yielding, and their low-growing habit makes it difficult for dairy cows or calves to graze them. They are best suited to sheep grazing. White clover is usually sown as a part of mixed sward pasture, where its DM yield varies from < 1 t up to 7 t DM/ha/year. On new dairy farm conversions where soil N concentration is low and reserves have not yet been created with organic matter, white clover contributes significantly to DM yield, but its contribution in developed farm situations is seldom over 30% at a single grazing and often much less. In contrast animal performance from pastures improves markedly with increasing clover content, up to 50% or more, so is highly desirable to maximise clover content for high cow performance. Research has shown clover can survive in pastures with up to 200 kg N/ha/year of fertiliser N when pastures are very well grazed and the clover stolons are not subject to excess shading. Insect pests, including clover root weevil, clover flea, slugs, and soil dwelling nematodes severely damage white clover content in pastures in some regions. Since its discovery in 1996 clover root weevil has spread throughout New Zealand causing an almost complete disappearance of clover from pastures typically for 1-2 years. For more see Managing profitably with clover root weevil (Farmfact 1-25). White clover is generally sown in a pasture mix at 3-4 kg/ha, usually a mix of two cultivars based on leaf size and stolon growing point density. Red clover in a mixed pasture. Red clover is a short lived (typically 2-4 years), tap rooted legume most commonly sown in summer dry areas where summer grazing is less intensive. 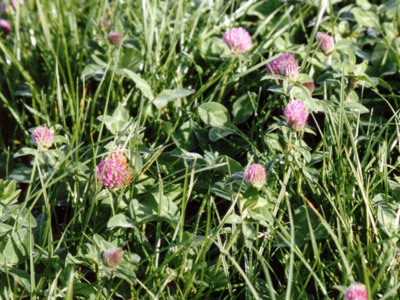 In intensive grazing systems red clover typically does not perform or persist well. It can last up to 7 years under favourable conditions, particularly lax grazing or where a long summer grazing rotation is used. Under irrigation pure swards of red clover can grow 17 t DM/ha/year, less than lucerne in this situation, but typically red clover DM yields are much lower in a mixed pasture where it must compete with other species. Red clover shows greater tolerance to clover root weevil than white clover. Red clover should be sown in mixtures at 4 kg/ha for diploid cultivars, with tetraploid types sown at heavier rates because of their larger seeds. It needs a sufficient plant density to contribute well in a pasture, because it does not spread like white clover, nor re-seed readily.